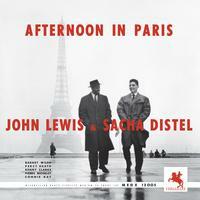 It was in Paris that John Lewis co-led this 1956 date with Sacha Distel, a French guitarist who never became well known in the U.S. but commanded a lot of respect in French jazz circles. The same can be said about the other French players employed on Afternoon in Paris — neither tenor saxophonist Barney Wilen nor bassist Pierre Michelot were huge names in the U.S., although both were well known in European jazz circles. With Lewis on piano, Distel on guitar, Wilen on tenor, Michelot or Percy Heath on bass, and Kenny Clarke or Connie Kay on drums, the part-American, part-French group of improvisers provides an above-average bop album that ranges from “Willow Weep for Me,” “All The Things You Are,” and “I Cover the Waterfront” to Milt Jackson’s “Bags’ Groove” and Lewis’ title song. The big-toned Wilen was only 19 when "Afternoon in Paris" was recorded, but as his lyrical yet hard-swinging solos demonstrate, he matured quickly as a sax man. A mythic LP and one of the best recorded in France! The more I listen to this record the more I like it. Very good recording for the period and well pressed. The contrast between the journeymen American Jazzmen and the up and coming French musicians is fascinating. So much fun, I ordered two more Sams Records a few days after listening to this one. Sam Records does it again ! The copy I received was perfectly flat with no defects. This is a wonderful mono recording - highly recommended. Upon playing side one, noticed a bad warp thus had to return. Hope it's not a batch issue.